"This book shows how using business as a force for good, not just pursuing short-term profits, can be better for consumers, employees, local communities, the environment, and your company's long-term bottom line." --Tony Hsieh, New York Times bestselling author of Delivering Happiness and CEO, Zappos.com, Inc.
B Corps are a global movement of more than 2,700 companies in 60 countries--like Patagonia, Ben & Jerry's, Kickstarter, Danone North America, and Eileen Fisher--that are using the power of business as a force for good. B Corps have been certified to have met rigorous standards of social and environmental performance, accountability, and transparency. This book is the authoritative guide to the what, why, and how of B Corp certification. Coauthors Ryan Honeyman and Dr. Tiffany Jana spoke with the leaders of over 200 B Corps from around the world to get their insights on becoming a Certified B Corp, improving their social and environmental performance, and building a more inclusive economy. The second edition has been completely revised and updated to include a much stronger focus on diversity, equity, and inclusion (DEI). These changes are important because DEI can no longer be a side conversation--it must be a core value for any company that aspires to make money and make a difference. While this book is framed around the B Corp movement, any company, regardless of size, industry, or location, can use the tools contained here to learn how to build a better business. As the authors vividly demonstrate, using business as a force for good can help you attract and retain the best talent, distinguish your company in a crowded market, and increase trust in your brand. Ryan Honeyman is a partner/worker-owner at LIFT Economy. LIFT is an impact consulting firm whose mission is to create, model, and share an inclusive and locally self-reliant economy that works for the benefit of all life. Tiffany Jana is CEO and president of TMI Consulting, the first diversity consultancy to be chartered as a benefit corporation and certified as a B Corp. Dr. Jana was awarded a 2017 Enterprising Woman of the Year Award from Enterprising Women magazine and is the coauthor of Overcoming Bias and Erasing Institutional Bias. "Our holistic vision for the company centers around our clothing, mindful business practices, and supporting every employee's purpose. Being a B Corp allows us to fulfill our purpose in a bold way with other like-minded companies. 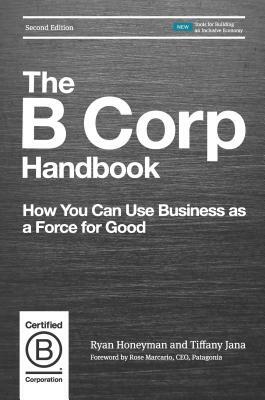 The B Corp Handbook serves as a guide for using business as a force for good."